The venom of the Male Black Widow Spider is not dangerous for humans. It is smaller than its mate and it has a completely different look. As the picture shows, the male black widow spider is 1/3 inches smaller than its mate (and weights thirty times less). If compared, the male has longer and thinner legs and its body is much more tube-shaped than the female’s. It does not have the red hourglass "onboard". Instead, it has a tiny –almost invisible - red spot under his abdomen. 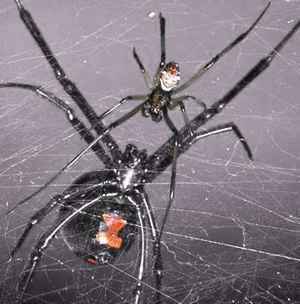 This picture shows the main difference between male and female black widow arachnids. Learn more about black widow spider bite following the links in the main menu.